David Willey admits every game has been ‘a bit of a struggle’ of late. 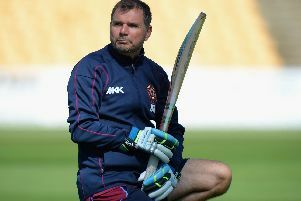 But the Northants Steelbacks star is hopeful he will be fit and firing for the NatWest T20 Blast quarter-final at Sussex Sharks on Wednesday. Willey suffered an ankle ligament injury in a win at Worcestershire in June and spent three weeks on the sidelines. He returned to action in a T20 win against Yorkshire last month and has since been busy playing his part in the Royal London One-Day Cup. But, still hampered by ankle and leg trouble, he had been failing to produce his best form in that competition before smashing a superb 91 in Monday’s win against Somerset. And Willey is desperate to hit the heights again in time for the crucial last-eight clash at Sussex. “I’ve got a few little niggles which mean I’m wheeling myself out there at the minute,” Willey said. “I’m struggling to bowl but hopefully I’ll be fit to play in the Sussex quarter-final. “I can’t get through my action as I can’t push off my left leg. “I’ve got a bit of a knee problem and in the field I’m having a few problems with my ankle, the combination of the two making it a tough time in 50 overs. Northants’ T20 quarter-final at Sussex starts at 6.30pm on Wednesday and will be shown live on the Sky Sports Ashes channel.